For use with both, steel and plastic strapping. Corner protectors safeguard a package by distributing the load over a greater area, enabling you to tighten the strapping to its maximum tension without damaging the package. Made of durable plastic and is designed to prevent damage to tightly strapped shipments. 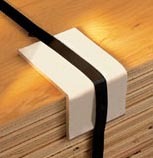 Each plastic corner is constructed from a specially formulated resin and is ribbed to hold the strapping firmly in place. Protect products from damage during shipment or while in storage. 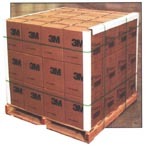 Edge protectors stabilize strapped or stretch wrapped loads and adds extra support for double stacked pallets. Custom quantities and packaging including private label are available. Contact your sales rep for details.